As inbound marketing inches closer to its 20-year milestone, it becomes ever more obvious that the evolution it started in marketing is still, well, evolving. The latest HubSpot State of Inbound 2017 report sheds light on that evolution. It takes a deep dive into the everyday world of marketing and sales, while also analyzing trends that will impact business in the future. From December 2016 to February 2017, HubSpot surveyed 6,399 professionals in 141 countries — the largest number of global respondents ever. The survey was offered in five languages and promoted via emails, blogs, and social platforms. In the end, HubSpot compiled a wealth of industry information in the report. So what does all this data actually mean for you? Let’s get to the five main “so whats” of the report. If you look at the State of Inbound from previous years, on the surface you find that the goal of marketing and sales appears fairly consistent: generate more leads and cultivate more customers from those leads. In fact, 70 percent of marketers list “converting contracts/leads to customers” as their top priority, and unsurprisingly 71 percent of sales respondents said their top priority is “closing more deals.” But the approach to those goals is where we see the wind shift. Marketing is being held more accountable for the process and sales is seeing its role transforming. As marketers take on more lead generation responsibilities, they are having to show the ROI of their activities. Marketers now list this as their second biggest challenge after generating leads. Yet, of those surveyed, 41 percent were still completely in the dark when it comes to proving their ROI. It’s no longer enough to simply generate leads. Today, marketers need to track their activities and attribute leads and customers back to their efforts. For sales, the biggest challenges now occur during the early stages of the process. Today’s buyers are more independent and may not even need or want a salesperson. 68 percent of salespeople say identifying a good prospect and then getting a response from that prospect is more difficult compared to just two or three years ago. That means salespeople need to change how they start the conversation and shift their role to become more of a trusted advisor. To do this, sales is putting a greater emphasis on thought leadership as a way to qualify leads and propel the conversation. 2. How Effective Are Your Marketing Efforts? Do you feel that your organization’s marketing strategy is effective? That is the big question, and just 61 percent of those surveyed answered “yes.” However, when the question gets broken down by seniority, the numbers fluctuate. At 69 percent, the C-level is more positive, while at 55 percent, the individual contributor is more concerned about the effectiveness of marketing. Now add into the mix inbound marketing vs. outbound marketing. By far, those who practice inbound marketing had a much more favorable view of their strategy (68 percent effective) as opposed to those who practice outbound marketing (32 percent effective). As buying habits evolve, today’s marketers place much more faith in the inbound process to attract, inform, and convert leads than they do in the outbound process. 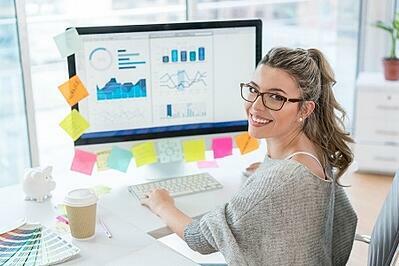 Taking this a step further, for those who could measure the ROI of their efforts, inbound was the clear winner, with 46 percent reporting that the inbound approach produced a higher ROI as opposed to only 12 percent with outbound. However, even with such a favorable view on the inbound approach, confidence in an organization’s marketing strategy appears to show a divide between its leaders and those executing the program. For true marketing effectiveness, an organization needs to be able to set a clear approach with defined goals and consistently communicate and report across all levels. Despite all the efforts from both marketing and sales to generate quality leads, the most trusted sources for prospects the past three years has been word-of-mouth and customer references. On the flip side for the third year in a row, the salesperson remains the least trusted source for a prospect. As prospects turn into leads, marketing and sales continue to struggle with how to manage and qualify them. When surveyed, only 30 percent of sales reported that marketing delivered quality leads, while 59 percent of marketing deemed their leads to be very high quality. Sales’ faith in marketing dropped by eight percent in the past three years. The numbers point to sales putting much greater stock in leads they generate themselves. This all boils down to a trust issue or, at the very least, a lack of communication between the two teams. Only 22 percent of those surveyed said that sales and marketing were tightly aligned in their organizations. 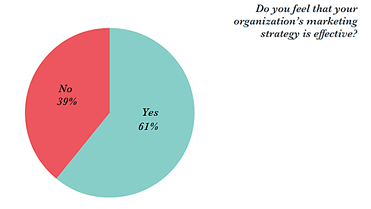 Yet, when the teams were aligned, 81 percent of those surveyed called their strategy effective, as opposed to only 27 percent in misaligned organizations. Adding even more fuel? When the two teams are tightly aligned, the leads from marketing were ranked as the top source for the sales organization. This is an area that remains in the works for most companies. From lead scoring to closed loop reporting, creating a qualifying process and lead routing is proving more important as organizations move further into the inbound process. Adding even more complexity to the issue: prospects are looking to outside sources to influence their buying decisions. That means that marketing and sales must join forces to harness more thought leadership, case studies, and testimonials tailored to the prospect’s needs. That, of course, means content and more content – but not always in traditional formats. The big mover in the category is video. When asked about distribution channels being added in the next 12 months, YouTube and Facebook video were by far the top two choices. Also disrupting the content playing field is the rise of artificial intelligence, augmented reality, and virtual reality, as well as the ever-changing landscape of social. With inbound marketing gaining momentum, sales reps positioning themselves as thought leaders, and SEO being more important than ever, content has never played a greater role. However, as the channels expand (especially social), marketers are given more opportunities to spread their message, but at a cost of further losing ownership of the experience. Marketers now must share their message on the prospect’s home turf. This means content will need to be more personalized and stylized than ever before. From videos to visuals to interactivity, prospects are also demanding more from content. The prioritization and resources to manage such a wide array of channels and formats can feel overwhelming, which means content planning and scheduling is no longer a nice-to-have, but a must-have. 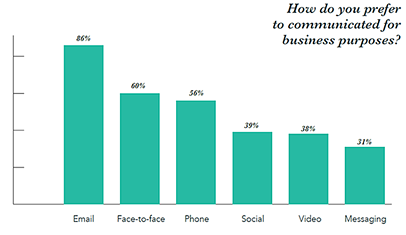 The preferred mode of communication for business purposes continues to lean toward the traditional methods: email (86 percent), face-to-face (60 percent), and phone (56 percent). Yet, social media and video are nearing the 40 percent mark this year, and messenger apps have shot up to 31 percent and even higher at 37 percent for C-level executives. As expected, LinkedIn is used by 78 percent of those surveyed for professional use, but catching up quickly is Facebook, with 74 percent using this platform for professional means. Maybe even more surprising is that more people are now using Twitter for professional use than they are for personal use. In today’s world of instant communication, it’s clear that the lines between professional and personal are blurred. While email remains the top tool, the newer mediums, especially messenger apps, are quickly gaining ground. Remaining aware and adopting new technologies can be a daunting task; however, today’s landscape demands that we do so. That also means marketers must rethink how we convey our messages. If a brand must be communicated in 140 characters, our stories must evolve to fit the format. Our world is changing. We’re witnessing the evolution of B2B inbound marketing and the breaking down of walls between sales and marketing. 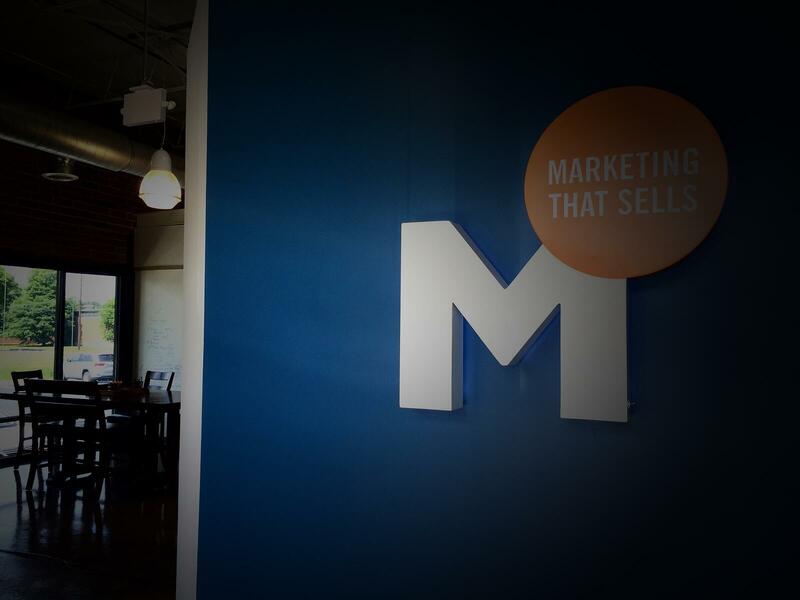 Personalized content, email marketing, and new technologies are critical tools we take seriously at Marsden Marketing. HubSpot’s State of Inbound report confirms what we’re seeing every day and makes us excited to continue delivering results for our clients. Want to see what a real-life marketing campaign looks like when we combine email and social promotions with digital marketing and new technologies? See how Calero grew its online event with integrated email, social, and technology to deliver 13 hours of webinar content to more than 500 prospects.